Metropolitan Tikhon celebrates Service of Prayer at opening of the Metropolitan Council Spring Session. 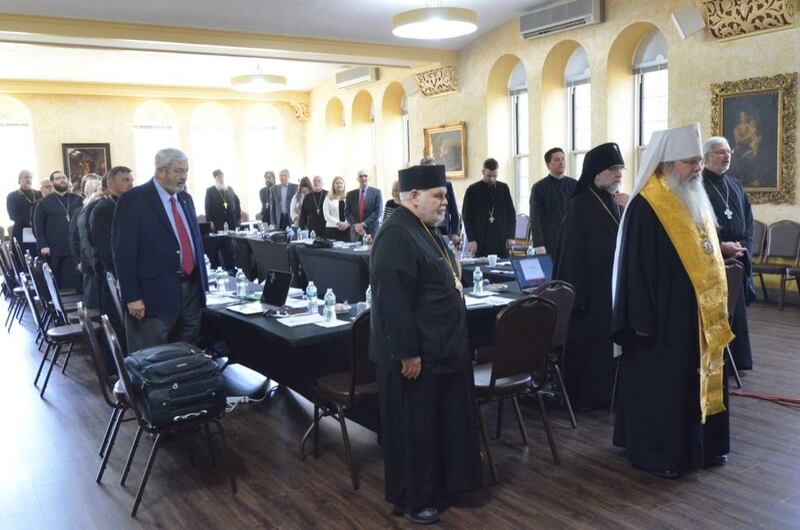 The Spring Session of the Metropolitan Council of the Orthodox Church in America closed on Thursday, February 23, 2017. As reported earlier, the semi-annual gathering opened on Tuesday, February 21, as His Beatitude, Metropolitan Tikhon presided at the celebration of the Divine Liturgy in the Chancery’s Saint Sergius of Radonezh Chapel. Also in attendance were His Eminence, Archbishop Michael and His Grace, Bishop Paul, both of whom are members of the Standing Synod of Bishops. Metropolitan Tikhon opened the first session, which was held at Immaculate Conception Seminary, Huntington, NY, following Tuesday’s Liturgy. According to Archpriest Eric G. Tosi, OCA Secretary, Metropolitan Tikhon reflected on his years as Primate of the OCA in his opening address, noting that it constituted a “time of transition” as he grew into the position. He went on to speak of the relative peace in the Church, which now allows for a more proactive and forward-looking vision. He also spoke about the spiritual dimensions of serving the Church on all levels, which should always be the focus of our work as the Church. He added that he is looking forward to the planning of the 19th All-American Council [AAC], slated to convene in Saint Louis, MO in 2018, and reflected on the direction of and possible themes for the Council. Finally, he thanked those who serve the Church and recognized the outgoing and incoming members of the Metropolitan Council. Archpriest John Jillions, Chancellor, presented his report, in which he outlined the major areas for which he is responsible. He focused attention on the work of the Department of Pastoral Life, specifically with regard to clergy compensation guidelines, clergy guidelines, and a number of areas related to clergy and pastoral issues. He reported on the work of both SMPAC and ORSMA and updated Council members on current and ongoing issues. Father Eric Tosi reported on work being done within his areas of responsibility. He presented a gift acceptance policy and a corporate signing policy, both of which were passed by Council members. He also presented a series of necessary Chancery building improvements, which Council members voted to fund, and updated the Council on the work of the Archives Committee and impending web site redesign. Finally, he presented an update on progress made with regard to plans for the 19th AAC, which included a theme presentation, a logo and a proposed agenda. These will be presented to the Holy Synod of Bishops for approval at their Spring Session. On Wednesday, February 22, Judge. E. R. Lanier, General Counsel, offered the report of the Legal Committee, which included a review of current and ongoing legal matters. Representatives of the Metropolitan Council’s various committees also presented reports on ongoing work within their respective areas. In her report, Melanie Ringa, Treasurer, presented an overview of the Church’s current financials, noting the success of the transition to proportional giving. She also discussed several budgetary issues for the 2018 budget and spoke on some restricted funds, sharing the work she is doing to finalize them, together with some recent bequests. Archdeacon Joseph Matusiak reported on the work of the Stewards of the Orthodox Church in America [SOCA], highlighting the success of the recent fundraising campaign as well as various initiatives slated to be undertaken in the future. Protopresbyter Leonid Kishkovsky, presented an overview of recent external affairs matters and interchurch relations. In keeping with a rotation of departments reporting to the Council, Matushka Valerie Zahirsky reviewed the work of the Department of Christian Education and Donna Karabin presented a report on the work of the Department of Christian Service and Humanitarian Aid on Thursday, February 23. Matushka Mary Buletza-Breton reported on behalf of the OCA Pension Board. An extended discussion on refugee issues resulted in a number of possible recommendations that will be presented to the Holy Synod. Also discussed were ways to increase effectiveness in the planning and operation of the Metropolitan Council. Other matters on the agenda included a resolution for releasing funds from a restricted Archives Fund for the purpose of improving the current space housing the OCA Archives, which Council members passed unanimously. The minutes and reports from the Spring Session will be posted after they are approved by the Holy Synod of Bishops. See related story and gallery. This entry was posted in News and tagged Archbishop Michael, Holy Synod, Metropolitan Council Spring Session, Metropolitan Tikhon, Orthodox Church by Orthodoxy Cognate PAGE. Bookmark the permalink.